Written: Clients receive a written, signed copy of the dog training guarantee on their Bark Busters receipt which is an official Bark Busters document and outlines all the training methods which must be adopted to resolve your dog's behaviour problems. Backed Up: The Bark Busters guarantee is backed up by the world's largest dog training company. Copies of all guarantee receipts are retained at Bark Busters UK Head Office. Service Guarantee: The Bark Busters guarantee simply states that if the owner continues to carry out all of the training instructions provided by the therapist at the training lessons, the Bark Busters therapist will continue to work with the owner, to achieve the desired results, for either one year, or the life of the dog (depending on the service obtained) at no additional charge. Most clients prefer the lifetime guarantee because they receive peace of mind for very little additional cost. Guarantee Moves With The Dog: If for any reason the dog needs to be re-homed, the remaining term of the guarantee passes to the new owner at no charge. In the case of the lifetime guarantee, the new owner will be trained at no charge and will receive the benefits of the guarantee for the life of the dog. The one-year guarantee applies if the re-housing is done within the first year. Clients can upgrade to the lifetime guarantee for an additional charge. Over 30 Years of History: Bark Busters has grown to be the largest dog training company in the world, with over 1 million dogs trained. 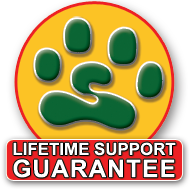 The guarantee has been part of the company since 1989 when company founders, Danny and Sylvia Wilson, decided that it would help to significantly reduce the number of dogs that were being euthanised and provide customers peace of mind for many years. The company is expanding rapidly in the UK and internationally and can be counted upon to fully honour its guarantee. Please consult your local trainer for pricing information. You can read more about the Guarantee and other questions on our FAQ's page.